Devonian rocks crop out over a large part of south Wales and the West Midlands, with isolated occurrences on Anglesey, the Isle of Man and the Lake District. The Black Mountains (Plate P667857), Brecon Beacons and Mynydd Epynt form the typical landscape with steep scarps and more gentle dip slopes developed on predominantly sandstone lithologies. The beds are magnificently exposed in the sea cliffs of the south-west peninsula — Somerset, Devon and Cornwall—where the largely marine facies of the Devonian forms the varied coastline of sea cliffs and coves from Torquay to Penzance. 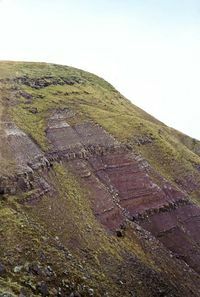 Devonian of the Black Mountains: the Senni Formation rests on the St Maughans Formation, the top of which is marked here by the two pale-coloured calcretes. P667857. Desiccation cracks infilled with sand, St Maughans Formation. P213128. 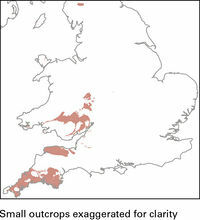 The first major group of nonmarine strata to be preserved in the geological succession of England and Wales is Devonian in age. These rocks, together with the upper part of the Silurian, were laid down on land, by a river system that drained part of the newly developed continent of Laurussia. They have a characteristic purplish red-brown colour because of the iron oxide content, and are known as the Old Red Sandstone (ORS) facies. At this time the British Isles lay at latitude 15º to 30º south of the Equator ( Figure P785799d); the climate was tropical and semi-arid, but seasonally wet. With this newly developed land a new fossil record emerges. Fossils include vascular plants and miospores that help to correlate the British and European successions and the first aquatic vertebrates. But fossils are not abundant in these continental rocks and the Silurian–Devonian boundary cannot be located precisely at present. It is placed at the top of the Raglan Mudstone Formation (Downton Subgroup and equivalents) below the level of the Bishop’s Frome Limestone. Early Devonian palaeogeographical sketch map. P785815. Sequential development and infill of rift basins in the south-west peninsula. P785816. The Bishop’s Frome Limestone reflects a long period of stability and soil development, and also marks a major change in facies from coastal mud flats and marine-influenced floodplains to the deposition of coarser grained sand on alluvial fans and floodplains (Figure P785815). The proportion of sandstone increases towards the top of the Lower Devonian St Maughans Formation (Lochkovian) (Plates P667857 and P213128), and there is a change in composition. It appears that a more distant northerly source, such as the Scottish Highlands, supplied sediment during the late Silurian and early Devonian, but this was later replaced by a more local source of Palaeozoic sedimentary and igneous rocks. Traditionally the Devonian rocks have been divided into three parts, Lower, Middle and Upper. All three divisions are present in the south-west peninsula where sedimentation was more or less continuous, first in lacustrine basins and then in marine basins that formed as narrow down-faulted graben along the northern reaches of the Rhenohercynian Ocean. The rift basins developed and filled sequentially from south to north, the southern basins filling with sediment while those to the north were still in the process of formation (Figure P785816). From south to north, the main basins and blocks include the Gramscatho Basin, Looe Basin, Plymouth High (Brixham high), South Devon Basin with the Landulph High, and the Tavy Basin. Thus, the age of the sediments varied from basin to basin and they are dated as early to late Devonian (late Emsian to late Famennian). Only the lowermost part is a nonmarine facies; this is the Dartmouth Group (D1) that was deposited in a freshwater lake into which fluvial sediments were poured together with slumped debris, and there is a transition into a fully marine facies, sandstone and mudstone of the Meadfoot Group (D1) and the Tamar Group (D2; D3). The highs were generally maintained at shallow water depths and carbonate reefs developed (Plymouth Limestone and Torquay Limestone), which were reworked from time to time so that limestone debris was eroded and deposited into the adjacent basins. Some of the major faults acted as conduits for magma: volcanic rocks are preserved on some of the highs (Ashprington Volcanic Formation) and form the topmost part of some of the basin successions (Greenway Tuff Member). The Ashprington Volcanic Formation (D) is mid to late Devonian in age; the lavas are up to several tens of metres thick and interfinger with brecciated lava (hyaloclastite), tuff and bedded volcaniclastic rocks. In the Gramscatho Basin there are some volcanic rocks, with turbidites, sandstones and limestone turbidites and a thick olistostrome, the Roseland Breccia Formation, which is in faulted contact with lithic and feldspathic sandstones of the Portscatho Formation (Gramscatho Group; D2) of mid to late Devonian age. At Lizard Point there is a classic ophiolite complex (D) of ultramafic and mafic rocks, together with hornblende schist, gneiss and metamorphosed sediment and basalt. These are the remnants of a mid-ocean ridge sequence that records a Devonian phase of ocean-floor spreading. Dates for the gneiss (Kennack Gneiss) range from 370 to 390Ma, but the mica schist is older (?Cambrian–Ordovican). The rocks have been subjected to intense metamorphism, and were thrust into their present location in the late Devonian (Famennian). In the Anglo-Welsh Basin Lower Devonian strata are widespread and thick. Middle Devonian rocks are absent, and this appears to have been a time of erosion. Upper Devonian strata rest unconformably on the Lower Devonian, but are more restricted in outcrop, thinner and are mainly fluvial deposits with some shallow marine sediments. Fluvial channel sand resting with erosional base on aelian dune sand, Peel Sandstone Group, Isle of Man. P680255. 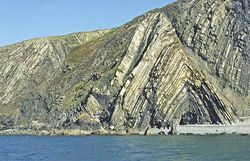 The Lower Devonian of the Anglo-Welsh Basin is divided into three formations, St Maughans (D1), Senni and Brownstones, and exceeds 800m thick in places. The Upper Devonian is considerably thinner — about 75m — and is variously divided into the Plateau Beds (Brecon Beacons), Quartz Conglomerate Group and the Tintern Sandstone Formation (D3) with the Portishead Formation in the Bristol area to the east. Cross-bedded sandstone is the most obvious component, and a cyclical pattern of sedimentation is apparent. A typical cycle starts with a basal sandstone or conglomerate resting on an erosion surface and passes up into siltstone and mudstone that may be calcretised. These sediments were deposited by meandering rivers; the cross-bedded sandstones represent the channel-fill deposits, and the siltstone and mudstone represent floodplain or floodplain lake deposits. Some greenish grey beds occur within the dominant purplish red-brown beds and reflect temporary reducing conditions when oxygen was limited, perhaps caused by a higher water table. Fish fragments occur sporadically, and early Devonian vascular plant remains have been collected from the Senni Formation. The Plateau Beds Formation contains sandstones that are generally harder than the Brownstones and form a resistant cap to the Brecon Beacons. In south Wales, the topmost unit is the Quartz Conglomerate Group that contains beds of white quartz pebbles and, in some parts, a fauna of brachiopods and crinoids indicate periods of marine flooding. In Pembrokeshire the early Devonian strata comprises the Cosheston Subgroup to the north of Milford Haven, and to the south the Freshwater West and Ridgeway Conglomerate formations (D1) overlain by the Skrinkle Sandstones Group (D3) of late Devonian age. On Anglesey, the Old Red Sandstone facies (D1) is about 500m thick, which includes the lower part that is likely to be Silurian in age. The lithology of the upper part is similar to the StMaughans Formation. On the Isle of Man, the Peel Sandstone Group (D1) preserves up to 2000m of conglomerate and sandstone deposited as alluvial fans, by braided streams or as aeolian sand dunes (Plate P680255). This fault-bound sequence records the unroofing of a Silurian limestone shelf succession that is no longer exposed in the region. In the Lake District, the Mell Fell Conglomerate (D3) is up to 3000m thick and ?mid to late Devonian in age. On the Midland Platform, the Lower Devonian rocks were largely removed by erosion prior to the deposition of younger strata, which may suggest greater uplift over the main part of the platform. About 150m of Upper Devonian strata, the Farlow Sandstone Formation (D3), are preserved around Brown Clee Hill. The Caledonides refers to a mountain chain that once stretched across the supercontinent created by the collision of Laurentia, Baltica and Avalonia during the early Palaeozoic. Remnants of this mountain chain are preserved in the eastern seaboard of North America, Greenland, Ireland, Scotland and Scandinavia. The Iapetus suture that marks the collision zone between Laurentia and Avalonia is identified on deep seismic reflection profiles across the north of England. This deep crustal structure has been reactivated during later extension and the zone is marked at outcrop by the Maryport–Stublick–Ninety Fathom Fault System. This fault system trends east-north-east from Maryport reaching the east coast at Smuggler’s Cave just south of Whitley Bay; it lies mainly on the North Sheet. Acadian folding at Cemaes Head, north Pembrokeshire. P667859. 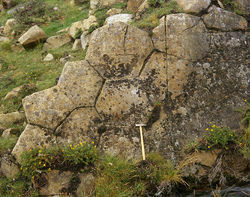 Columnar jointed sill in the Aran Volcanic Group, Gwynedd. P008214. Granophyre sill in Cwm Croesor, Snowdonia. P007054. Northward movement of the microcontinent of Avalonia as it rifted away from the continent of Gondwana was central to the Caledonian orogenic events of England and Wales. The process lasted for 95 million years from the early Ordovician to the Devonian (Emsian) and is recorded by multiple phases of folding in the Lower Palaeozoic rocks (Plate P667859). The final pulse of deformation is generally dated as early Devonian (the Acadian Event) but is thought to have been late Silurian in Leicestershire. 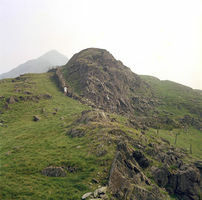 Subduction-related volcanism occurred in a volcanic arc setting in the Lake District and in a back-arc setting in Wales. Vast quantities of both mafic and felsic magma were produced, some of it erupting as lava (Olv) and volcanic ash (tuff; Otf ), some remaining trapped underground to form intrusions (OS; SD; D). The mafic rocks include andesite, basalt and related types (Plate P008214), the felsic rocks are rhyolite, dacite and related types (Plate P007054). The intrusions form significant bodies in some places. For example in the Lake District, the Ennerdale and Eskdale granites were intruded above the subduction zone and during the final stages of the Borrowdale volcanicity at about 450 Ma. Later orogenic plutons, such as the Shap and Skiddaw granites (OS ), are Emsian in age and postdate the main Caledonian slaty cleavage. The granite outcrops at the surface are only a small part of much larger concealed plutons, and the Weardale granite (394 Ma) that underlies the Alston Block is completely concealed beneath Carboniferous rocks. In Wales, late and postorogenic granites include the Mynydd (438 Ma) and Tan y Grisiau microgranites. On the Midland Platform, sills of microdiorite and lamprophyre were intruded into Neoproterozoic, Cambrian and Ordovician strata (OS), most are too small to show at this scale: one, near Nuneaton has been dated at 442 Ma. It is likely that this region had a high heat flow, or thermal gradient, and intrusion of magma followed the initiation of subduction in Tremadoc times. As magmatic activity waned crustal extension and thermal subsidence controlled the next phase of deposition, which continued from the late Ordovician until the end of the Silurian. The Caledonian tectonic cycle ended in the early Devonian (Acadian phase) when the Silurian basins were inverted — the accumulated strata were compressed, uplifted and eroded. Tectonic uplift created a mountainous region that stretched to the north, and the Old Red Sandstone facies was derived by the erosion of this newly elevated mountain range. In the south-west peninsula, basalts and gabbros that record a Devonian phase of ocean floor spreading along the Avalonia–Armorica suture are preserved at Lizard Point (D). These rocks were subsequently obducted — caught up in thrust slices ( Figure P785798) during the closure of the Rhenohercynian ocean basin, later in the Devonian. This page was last modified on 28 July 2015, at 17:05.